I love to wear scarves and to accessorize whenever possible; but once you build up your scarf collection it is time to organize it. Your box of scarves must be visible in the morning or when you are getting dressed, if not – then you might as well forget it. Also in the morning when you are tired and you in a hurry for work, you will not have time to hunt for the proper scarf. My method is to use a box with dividers, and to group the scarves into categories of different hues and colors. 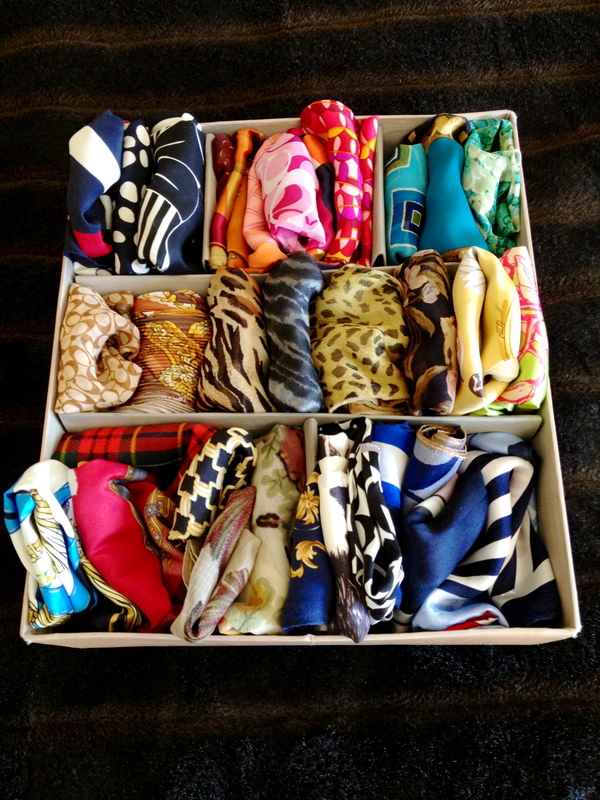 Keep the favorite scarves close by in the a box like this one seen here. I keep my box inside of the walk-in closet; so it is easy to see and match it to my outfits. This entry was posted in Fashion and Style and tagged Fashion, in a hurry, love to wear scarves, Scarf, storage. Bookmark the permalink. What a great idea! I recently bought a few dividers from The Container Store, so I will definitely try this!